There is always something to bring you back to Bled. During each season you will discover something to attract you. In winter (zima) 2011 and January 2017 the lake froze. People were skating, playing ice-hockey walking to the island. The pletna boats we out of the water. In the autumn/fall (jesen), the rich red and brown colours appear on the trees around the lake. The spring and summer (pomlad, poletje) are a festival of sport, arts and music. 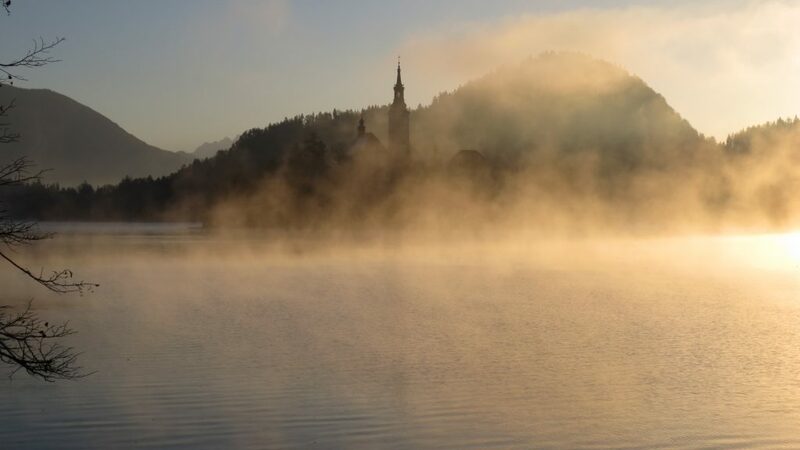 Whether it is winter skiing in Gorenjska, summer concerts, the rowing and running, the Winter Fairytale (Advent and Christmas fair), Bled changes with the seasons. Once the Christmas tree is taken down and the Winter Fairy-tale packs up for another year, the town becomes very quiet. There are still some winter activities – the ice-rink is open in the Park Hotel terrace. There are some events and sports at Straža. If there is snow and it is good enough, there will be skiing there. There is skiing in Pokljuka the annual biathlon is scheduled for the end of January and beginning of February. The town accepts that it is time for a communal winter snooze. Easter in 2018 was on 1 April. In 2019 it will be 21 April. In Rio they have Mardi Gras, some of us have Shrove Tuesday. Around the Christian world there are celebrations and preparations for Lent. In Slovenia on the eve of this traditional religious observance, there are parades and costume extravaganzas. This carnival season tends towards welcoming the spring and scaring away the old year. Parades are held in many towns in Slovenia including Bled where up to 20 groups from the community dressed in costume and fancy dress, parade through the streets – and the snow – on the Sunday before Lent. The most famous parade in Slovenia is the Kurentovanje celebration in Ptuj – about 200 km from Bled. Here the magnificently costumed Kurents parade through the town chasing away winter by jumping and making noise. Tradition has it that they bring spring and abundance to the land. The unmistakable shaggy outfits consist of a hat, a sheep-skin suit, green or red knee-high stockings, bells attached to a chain around the belt, and a ježevka (a thick stick with hedgehog spines). The door-to-door rounds of the Kurent are on the UNESCO List of Intangible Cultural Heritage of Humanity. Škoromati are the oldest Carnival masks in Slovenia. On Shrove Saturday, you can find them in the villages of the southern slopes of the Brkini Hills and the Podgrajsko-Matarsko Plain in the south west of the country. Here the costumed characters go door-to-door rounds collecting gifts from people’s homes on a “Poberija”. The Laufarija festival in Cerkno (about 60 km from Bled). Ljubljana holds the Dragon Carnival, where a large green dragon leads the parade. There is an Istrian Carnival on the coast. A large carnival at the central square in Maribor. And in nearby old town centre of Kranj, you can join in the Prešeren Carnival. Back in Bled, there are events, in March and April, but fewer. Some take place each year, so for 2018, read also 2019. People staying in Bled can take special bus connections to the main ski resorts; Vogel, Krvavec, Kranjska Gora, Cerkno and 3ländereck as well as the less demanding slopes in Pokljuka. The sound of a big brass band heralds the beginning of spring and the Easter celebrations bring the town – and the tourists – back to life. In 2018 Easter is on 1 April. If you are planning beyond this year, in 2019 Easter celebrations will be a little later in the month, 19 April. The traditionally liveried Godba Gorje brass band plays at every significant occasion in Bled and the nearby villages. The Municipality of Gorje is about 5 km from Bled, but many of the musicians are from the town. It has represented Slovenia around the world over the decades. They look impressive and the sound they make is the sound of Gorenjska. The Easter activities and the season have begun. It is no exaggeration to say that Bled is a sunny place. The sun shines year-round and while there are sometimes torrential showers, and rain lasting for days on end, even in the summer, you are more likely to experience a sunny day any time of the year. Spring brings cool days and evenings. From spring through to the summer, you might experience night time thunder and lightning as storms roll in from neighbouring Italy or Austria. The first annual regatta is held at the end of April; in 2018 on 21 and 22 the 59th May Day Rowing Regatta. In May (this year on 18th to 20th) the Accordion Festival comes to town. It began in 2013 and it is an event worth making the trip to see. Accordionists, accordion clubs, professional musicians, learners, amateurs and lovers of the sound descend on Bled and spend at least a day playing all over the town. It is one of the most joyful events of the year. The climax is when all the musicians line the lake shore in Spa Park to play one song together, Slavko Avsenik – “Otocek sredi jezera” (Island in the middle of the lake). It is a wonderful experience. If you have missed it already you should keep an eye out for next year. Search YouTube for “Main Accordion Performance” and “400 Accordions” to see how they performed in 2014 and 2015. From the end of May, schools and colleges throughout Europe release their students into the world. They buy Interrail tickets and before too long arrive in Bled finding beds in town’s hostels. At this time the weather is fresh and cool and bright and sunny. But there is not a lot of organised entertainment. This is the time to use Bled as a base and explore Gorenjska, the nearby villages and towns. Time to hike and sail, to cycle, to enjoy the rivers making their way down from the Alps. At the end of May, the competitive rowing season begins, and young athletes are active on the lake. This is a centre for the Slovenian national rowing team. It can be hot. During this period friends who are long-time residents report that they have experienced temperatures of up to 40 degrees C at the beginning of the summer. I have enjoyed 35C for more than 10 consecutive days in July and August. There is no guarantee there won’t be rain, but it is unlikely. In June, the restaurants and bars that have been closed for the winter open their doors and tables appear outside. Events become more frequent. Bled Castle has been open all winter, but at the beginning of June (2nd and 3rd June 2018), the Medieval Days campsite sets up outside the walls of the castle. Events climax with the music and sporting festivals that dominate the summer. The restaurants and bars are at their best, the days are long, and the nights are hot. People are extremely well behaved. Spirits are high but there is little or no public drunkenness, no public misbehaviour at all. You will feel (and are) safe. The buses are full, the roads are busy and at times the town gets choked. 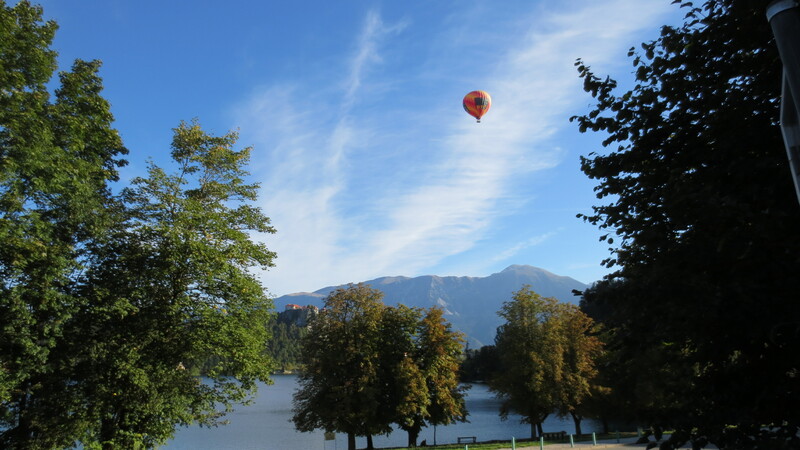 If you are not planning a long stay in Bled, aim for mid-week during July and August. Although some of the best events are at the weekend. I like to disappear on Saturday and Sunday afternoons. This is the time the weekenders and day trippers arrive by bus, by car, by motorbike. Families from other parts of Slovenia or Italy or Austria fill the streets and the lakeshore. Yet within a few minutes you can escape to a quiet place away from the lake. It is easy to find walks in places where the buzz of the holiday centre is replaced by the buzz of insects. Cycle to Selo or Bodešče or Ribno. Walk to Kupljenik – get advice about where you can get the most spectacular views there. If you want to escape into the mountains, first visit the Infocenter Triglavska roža for advice about safe walks, maps and any other serious walking kit. The colours around the lake change – it is spectacular. From about mid-August you can feel a change. As the church bells peal around the town and nearby villages on 15 August for the feast of the Assumption, you may feel a slight difference in temperature. There is a pleasant breeze and the evenings are cooler. And in the early mornings there are more photographers around the lake capturing the new colours emerging from the green hillsides. By the end of November some of the mountain peaks in the distance begin to turn white. The early morning mists are pink and orange in the sunrise. The “blue hour” is in the evening. In 2017 Bled was ranked in the top 10 most popular winter destinations for Instagram lovers. As 2016 ended on New Year’s Eve, the town partied in sub-zero temperatures, under the Christmas lights. 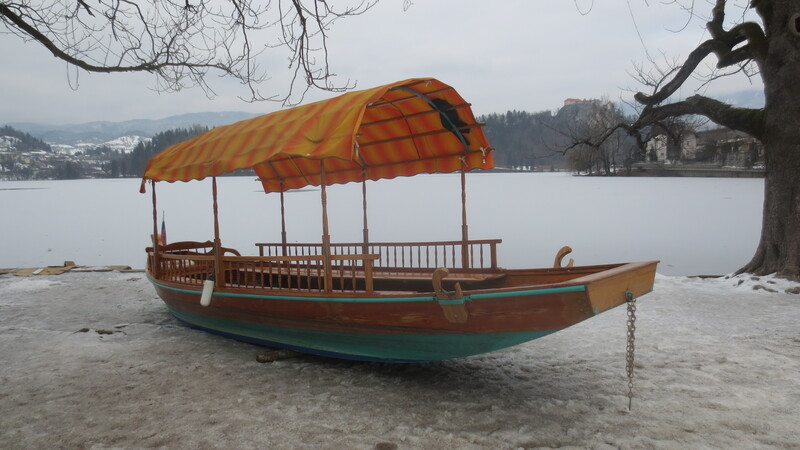 Within the first few days of 2017, the pletna boats had been pulled from the water as the lake froze, the first time since 2011. For most of January the lake became a play space and people walked to the island. The surrounding mountains white against a clear blue sky. A white winter cannot be guaranteed, although 2017 ended with more snow. Even well into February 2018 there were still many days of skiing on Straža. December arrives as does the Christmas market “Winter Fairy-tale”. 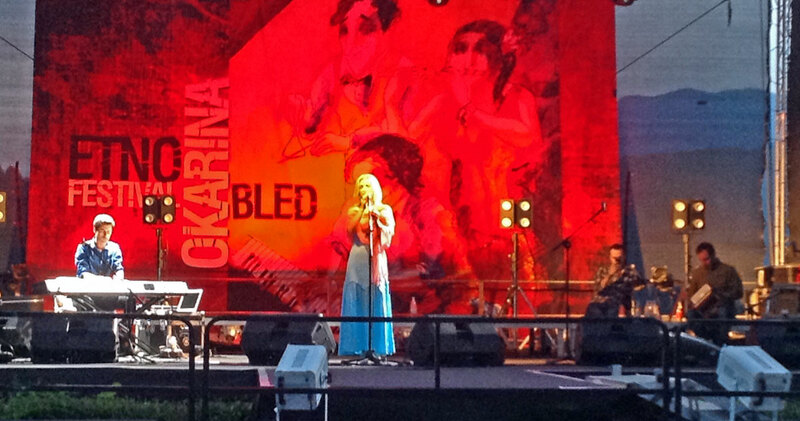 Since 2015, Bled has set up a market near the shore of the lake with entertainment every evening and highlights during the month. You can see the tall Christmas tree covered in white lights from all around the lake. Musicians perform on the stage every night. Fires and blankets keep you warm. The festival goers share the trellis tables where they eat hot food from the stalls operated by the town’s restaurants. They drink beer and mulled wine (kuhano vino), and schnapps and hot chocolate (vroča čokolada). On the evening of the 30th December, one big community event brings locals from their homes and tourists from their hotels. They meet all around the lake and attempt a “Circle of Friendship”. Stewards direct the crowds of people into tidy lines. We all hold glowsticks and hold hands. There is a party on New Year’s Eve when temperatures can be minus 10C or lower. Fireworks mark the end of the old year and the beginning of the new. And we sing, and we dance, and we cheer, and we wish everyone “srečno novo leto”. And we enter a new year. Slovenian Cultural Holiday on 8 February 2019 will mark 170 years since the death of France Prešeren who is regarded as one of Slovenia’s greatest poets. He is the most revered and is a symbol of Slovenia’s nationhood. A verse from his poem A Toast is used in the Slovenian National Anthem. He wrote about Bled in The Baptism at The Savica and lived in nearby Vrba. There is information about Prešeren scattered throughout this book, but if you want to explore his life and times, visit Kranj where he worked. Skiing is the main sport at this time of the year. Both Vogel and Kravavec are each about an hour from Bled and special buses leave Bled in the morning returning in the evening during the winter ski season. Through January and February there are some water sports events around the lake and in Pokljuka skiing any events. Time to take a moment to reflect, a glass with a friend and in no time at all the party begins all over again.